How was everyone’s day today? I had a pretty good day at work. Got lots of stuff done and then was treated to a free massage. That’s right, FREE! We had a Wellness Fair at work today and they were offering some freebies. I had a lung screening to check my lung capacity and then had my blood pressure checked which was all in the normal range. Also got my BMI calculated but we won’t go there..LOL! They even had some tea and yummy healthy snacks for everyone. After doing my rounds and stopping at almost every booth to pick up free information on how to eat right, get plenty of exercise, yada yada yada….I made a beeline for the massage booth and signed up for a much needed massage. After working in the yard on Sunday my back has been really complaining every time I bend down to pick up something. I think it’s angry with me because of all that bending and stooping I was doing while cleaning the yard. The massage did help and offered some temporary relief. Too bad we don’t get treated to a massage everyday. It’d sure be nice. Maybe I should start a petition…lol! After a busy work day it’s nice to come home and de-stress a little. I’m a working mom so I have a family to feed so after fixing dinner and making sure everyone’s been fed and that the dishes are done and put away, I like to kick my feet up and do some knitting. I don’t know what it is about wanting to always keep my hands busy all the time whether it’s knitting, crocheting or working on some craft project at my desk. I’m just a busy bee at all times. 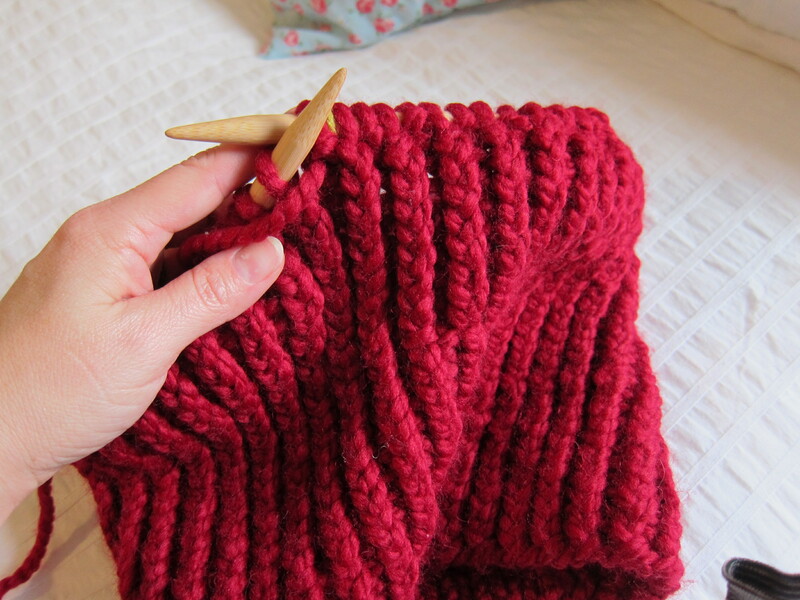 Here’s a pretty red cowl scarf I’m knitting for my mother. She likes to bundle up and keep warm. I’ve never knitted with circular needles before so it was kind of fun to learn that process. When I started I intended to use the seed stitch for this scarf and even looked up a tutorial on YouTube to learn how and then followed the steps for the first few minutes of the video. I then turned my computer off and ventured off on my own thinking I was a hot shot and could carry on without any further video instruction. Now if you look closely, this is not the seed stitch and I don’t know what happened or what I did wrong….lol! but I didn’t care, I just kept knitting (think of Dory from Finding Nemo….just keep swimming, just keep swimming, just keep swimming, swimming, swimming ….what do we do….we swim, swim, swim….). Have a fantabulous night everyone! Hi Ingrid… Thanks for stopping by my blog and liking my recent post. The cowl looks great… I know what you mean about seed stitch, it took me so many times to finally get it right. I wish I knew what you did cause it looks great.